Students at the East Meadow School District’s W.T. Clarke Middle School participated in a two-day Hoops for Heart event to help raise money for the American Heart Association. On Jan. 23 and 24, all students participated in a knock-out basketball contest during their physical education classes. Class winners advanced to the final, held after school on Jan. 25. The overall winner was eighth-grader Tyseer Rahman, who was presented with a Hoops for Heart basketball. The school congratulates all the class winners along with Tyseer. Eighth-graders Sophie Aprea, Emily Brown, Isabella Canzoneri, James DeSimone and James Papacostas; seventh-graders Jadon Chang, Aanya Mehta, Maddie Millman and Dominic Murawski and sixth-graders Caleb DaRocha, Jack Giudice, Cole Kaufer and Jack Morovich, each earned spots in the final as class champions. Donations are being collected until Feb. 14 as the W.T. Clarke community looks to further their support of the American Heart Association. Photo caption: W.T. 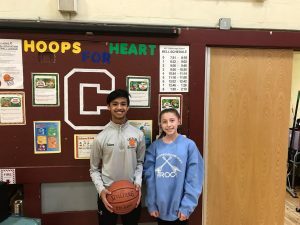 Clarke Middle School eighth-grader Tyseer Rahman, left, and Sophia Aprea, right, were among the class winners of knock out during the Hoops for Heart tournament from Jan. 23-25.